Core Image is incredibly powerful, but sometimes produces images with non-obvious properties. Image Rehab attempts to clean up some of these properties. 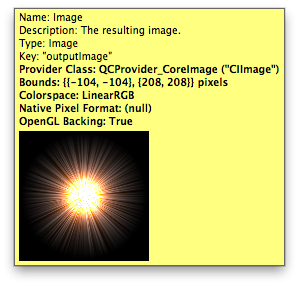 Image Origin is restored to (0,0) — potentially useful after cropping an image. Unbounded Images are trimmed to the dimensions of the Rendering Destination. It's meant to be used after cropping (or any other image operation that would result in a nonzero origin). Useful when doing further compositing work with the image. cool seems useful. misleading by the title. i initially thought this was to be some sort of restoration patch but i'm all about trying to tidy up the editor so im sure someday i will find this useful. i find there are times when i don't want to reset to 0,0 primarily within the a mouse x,y coordinate system or something. like leaving an object where you dragged it but this im sure will provide cure a un foreseen headache. When you rotate an image using Image Transform, the rotational anchor point is specified by the "Origin X"/"Y" inputs on that patch, regardless of where the origin of the itself is. Confusing. Confirmed buggy zooming instead of rotate on 10.6.2 sans Native Core Image Rendering. Also can confirm that flagging Crop Images to Visible Area whilst leaving unflagged Native Core Image Rendering will also give a rotation from the transform image patch correctly. Please file a bug report for this bug, and attach the composition used, as well as concise steps to reproduce it. Q: offset the rotation axis? How to offset Anchor Point of an image?